Remember, they tell us that the universe is accelerating in its expansion. So what does that mean for the universe's cosmological parameters? So what values for lambda do we get from the supernovae? Acceleration means OmegaL is "beating" OmegaM. 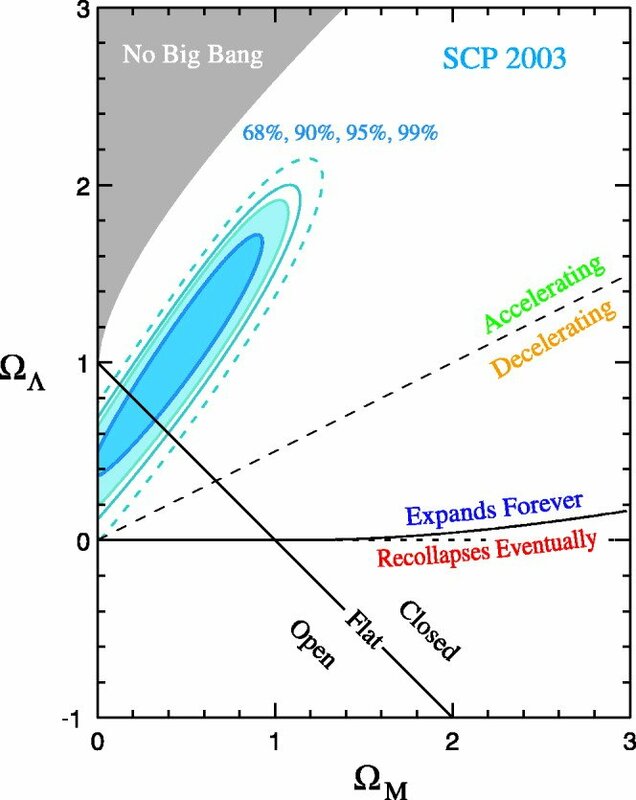 An accelerating Universe is older. (ie the expansion rate was slower in the past, so the universe took longer to grow to its present size. Even universes which expand forever can be spatially flat or closed, and universes which collapse may yet be spatially open. As time goes by, Lambda wins. Flambda ~ R, Fgravity ~ R-2. If the cosmological constant exists, it was end up dominating the expansion. BAO = tracing large scale structure of galaxies, sensitive to matter density parameter.